insert into stats(record_time) select current_timestamp ; we get following error. 7454: Date Time field overflow. TIMESTAMP(6) data to a TIMESTAMP(0) and that's why you are getting this error. How to add 10 minutes to current timestamp in TD? SEL CURRENT_TIMESTAMP + INTERVAL '10' MINUTE. The following example is taken straight from Teradata Functions and Operators reference manual. have a column in source strdate1 as VARCHAR(23) and the value being '20100310181010'. 2. 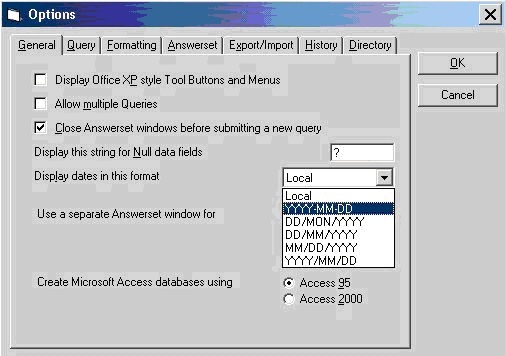 Paste the Source SQL Query in the "Query" window. 3. Select the following Menu Option "File=>Export Results"
4. Go to "Tools=>Options" and select the Date Format as 'YYYY-MM-DD'. P.S: This option is used when a date column exists in the table. 6. Open the Saved File (ex. 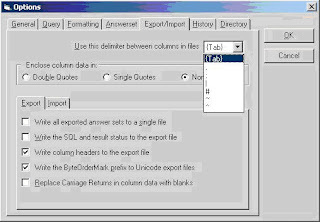 Test_Export.txt) and remove the First Line from the File Which contains all the column Names. 7. Login to the Target Database using Teradata SQL Assistant (Dev). 8. 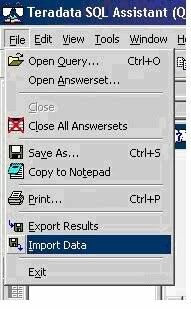 Select the following Menu Option "File=>Import Data"
9. 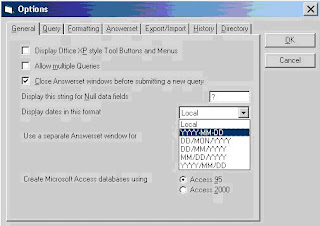 Paste the SQL Insert Query in the "Query" window. NOTE: There should be a '?' as a Place-Holder for all the columns in your Source File. 10. Run the Query (Press - F5). 11. Turn off the Import Data mode and resume querying. 1. Make sure you have the columns in Excel in the same order as the table you created. Remove the header rows from the Excel file and Save the file as comma delimited file from Excel (CSV File). 2. In SQL Assistant set the Delimiter as ","(comma) . 3. Go to "Tools=>Options" and select the Date Format as 'YYYY-MM-DD'. 4. From Teradata SQL Assistant, click 'File', then 'Import Data'. You must supply a ? (question mark) for every column. So, for a table with 5 columns the values command would look like: values (?,?,?,?,?). 6. Highlight the insert query and Press F5. This will prompt you for a file location. Select the appropriate file. 7. This will load in the order in which they appear in your text file, which is why it is important to match the columns in Excel with the order of the columns in your table. 8. Turn off the Import Data mode and resume querying. 1. Difference between Teradata and Other RDBMS? 2. Draw the picture of Teradata warehouse? 3. What are the differences between Star schema and Snow flake schema? 4. Differentiate Dimension table and Fact table? 5. What is Fact less fact table? 7. Explain Teradata important components with architecture? 8. Difference between SMP and MPP? 9. Explain the Shared nothing architecture? 10.What is a set table? When we will use multiset table? 11.What is the usage of Fallback? 12.How many primary keys we will apply on a table? 13.How does rows store in Teradata? 14.Tell me the types of Indexes? 16.The role of SI in teradata and explain the types? 17. How do we create a join and hash indexes and explain the scenerios? When we will use exactly? 18.What is the meaning of Transient journal overhead? 19.What is skewness in teradata? 20.What is a subtable and when it requires? 21.What is the usage of coalesce function? 22.When we will use null-if function? 23. Can you write the syntax of substring and case expression.? 24.What are the different types of tables? 25.Explain the differences between global temporary table and volatile table? 26.Describe the use of Explain command and its features? 27.Have you collected statistics in your project? 28.Difference between FastLoad and Multiload? 29.Difference between BTEQ export and Fast Export? 30.Difference between general Delete and Multiload delete? 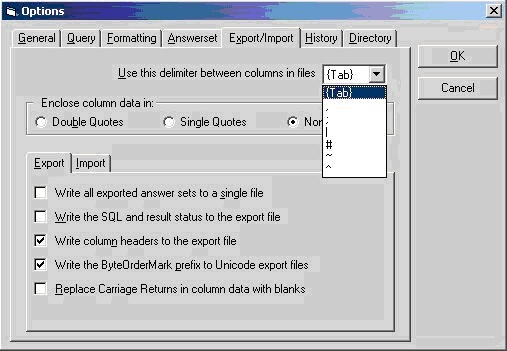 31.What is the structure for importing a file in BTEQ? 32.What is the structure for importing a file in Fastload? 33.What is the structure for importing a file in Multiload? 34.What is the structure for importing a file in Tpump? 35.How do you pass multiple files in fastload and multiload? 36.Explain different phases of fastload? 37.Explain the phases in multiload? 38.Describe the error tables in fastload with structures? 39.Describe the error tables in multiload with structures? 40.Difference between multiload and Tpump? 41.What is the use of Error code and Activitycount in Bteq? 43.How do you handle the errors in ER and UV tables? 44.How do you check the status of scripts ruined? 45.Tell me the limitations of multiload? 46.Tell me the limitations of fastload? 47.What is the usage of filler in multiload? 48.What is the DIF format and when we will use? 49.Difference between Subquery and Corelated sub query? 50.What is a node and how many node system you have in your project? 51.What are the various ways to execute a query in teradata? 52.What is the difference between procedure and function? 53.What is the difference between macro and procedure? 55.What are join strategies?Explain clearly with examples? 57.What the various ways to tune a teradata query? 58. How do you select an index for a table? 59.Write a query for finding second maximum salary? 60.Write a query for a.finding duplicate rows? 61.There are two tables called customer table and calls table. If a customer made a call, that record should be there in calls table. I need the details of customers who didn’t made any call?Write a query? Deptcode. I need all deptcodes and their corresponding employees? 63.Write a view with more then one table? 64.How do you handle if multiload script got failed in acquisition phase? 65.How do you handle if multiload script got failed in apply phase? 66.How do you handle if fastload script got failed in first phase? 67.How do you handle if fastload script got failed in second phase? 68.How do you handle Bteq script failures? 69.How do you pass parameters to a fastexport script? 70.Describe the layout of multiload? 72.Describe the layout of fastexport? How many codd's rules are satisfied by teradata database? 1. When they are created, its definition goes into Data Dictionary. 2. When materialized data goes in temp space. 4. you can collect stats on GTT. 2. Data is stored in spool space. 3. thats why, data and table definition both are active only upto session ends. FSLDM --> Financial Services Logical Data Model (Teradata FS-LDM 7.0) its developed by Teradata for the financial sectors (Specifically for Bank). it can be customised based on the user requirement. StarSchema --> Its a relational database schema for representing multidimensional data. The data is stored in a central fact table, with one or more tables holding information on each dimension. Teradata is smart enough to decide when to redistribute and when to copy. It compares the tables. Are they comparable? or one is big as compared to the other?Based on simple logic it decides whether to distribute the smaller table on all the AMPs or to copy. it is making AMP local JOIN. Remember the basic thing what ever Teradata does. It does keeping in consideration for Space and Performance and not to forget the Efficiency. If the table is small redistribute them to all the AMPs to have the AMP local Join. Always JOINs are made AMP local if it cannot then you have the high chance of running out of SPOOL space. What are set tables and multiset tables in Teradata?Explain with an appropriate example? 1) Set tables cannot accept duplicate at row level not Index or key level. The amp which is having more data will take longer time and makes other amps waiting which leads processing wastage In this situation (unequal distribution of data)we get Skew Factor HighFor this type of tables we should avoid full table scans. 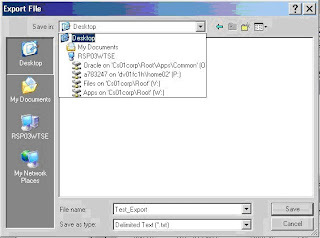 Vprocs:Virtual process From PE to AMP (This is the network root via MSP(message passing layer),The processing data will store in Disks(These are Physical disks),Each Amp have too many P.disks,to migrate these P.disks The Bynet Network maintains Virtual disks.These V.disks will responsible for data migration.hence they are called as Virtual Process(VPROCS). Fast Load will load the Data Fastly,Mean Concurrently,Bulk Insert Internally TeraData server will Create Bulk insert DML statement (Like: insert into Table1 as sel * from Table2 with data) For Fast Performance it will not support the duplicate values,Referential Integrity. What is use of compress in teradata?Explain? stored in column header and is to be used as default of that column unless a value is present. MULTILOAD will creates 2 error tables, 1 work table When MULTILOAD fails We have to unlock the Main Table, here error tables and work tables are not locked like FLOAD. Is it possible that there r two primary key will be in a same table? In a table can we use primary key in one column and in another column both unique and not null constrains.if yes how? Yes, you can have a column for Primary key and have another column which will have no duplicates or null.e.g.A Salary Table will have employee ID as primary key. What are the types of tables in Teradata ? How many error tables are there in fload and Mload and what is their significance/use? Can we see the data of error tables? When mload job fails, can we access mload tables? If yes then how? ET TABLE 1: where format of data is not correct. it maintains only error field name, errorcode and data-parcel only. MultiLoad uses the ET table, also called the Acquisition Phase error table, to store data errors found during the acquisition phase of a MultiLoad import task. A log table maintains record of all checkpoints related to the load job, it is essential l/ mandatory to specify a log table in mload job. This table will be useful in case you have a job abort or restart due to any reason. Teradata will redirect the new inserted row as per its PI to the target AMP (on the basis of its row hash value), and if it find same row hash value in that AMP (hash synonyms) then it start comparing the whole row, and find out if duplicate. 1. It allows us to write SQL statements along with BTEQ commands. We can use BTEQ for importing, exporting and reporting purposes. 2. The commands start with a (.) dot and can be terminated by using (;), it is not mandatory to use (;). 3. BTEQ will assume any thing written with out a dot as a SQL statement and requires a (;) to terminate it. What are cliques? What is Vdisk and how it will communicate with physical data storage at the time of data retrieval through AMP? A clique is a set of Teradata nodes that share a common set of disk arrays. Cabling a subset of nodes to the same disk arrays creates a clique. Each AMP vproc must have access to an array controller, which in turn accesses the physical disks. AMP vprocs are associated with one or more ranks (or mirrored pairs) of data. The total disk space associated with an AMP is called a vdisk. A vdisk may have up to three ranks. Hence Vdisk will communicate with physical storage through array controllers. What is the difference between MultiLoad & Fast load interns of Performance? If you want to load, empty table then you use the fastload, so it will very useful than the MultiLoad ,because fastload performs the loading of the data in 2phase and its no need a work table for loading the data . Phase2 - After giving end loading command, Amp will hashes the record and send it to the appropriate AMPS. Phase5 - In this table locks will be released and work tables will be dropped. Each Foreign Key must exist as a Primary Key. Foreign Keys can change values over time. 1. Foreign Keys can change values over time. 2. Each Foreign Key must exist as a Primary Key. Indexing is a way to physically reorganize the records to enable some frequently used queries to run faster. The index can be used as a pointer to the large table. It helps to locate the required row quickly and then return it back to the user. The frequently used queries need not hit a large table for data. they can get what they want from the index itself. - cover queries. Index comes with the overhead of maintenance. Teradata maintains its index by itself. Each time an insert/update/delete is done on the table the indexes will also need to be updated and maintained. V2R6 included the feature of replica in it. in which copy of data base are available on another system which means V2R6 provide the additional data protection as comparison to V2R5 while if data from one system has been vanishes. Where is the GRANT table option usually done? When tables are newly created, what is the default role and what the default privileges which get assigned? The GRANT option for any particular table depends on the privileges of the user. If it is an admin user you can grant privileges at any point of time. The default roles associated with the newly created tables depend on he schema in which they are created. What is error table? What is the use of error table? * Captures rows that contain duplicate Values for UPIs. * It logs errors & exceptions that occurs during the apply phase. * It logs errors that are occurs during the acquisition phase. What is optimization and performance tuning and How does it work in practical projects. Explain with an example. Optimization is the technique of selecting the least expensive plan (fastest plan) for the query to fetch results. 2. Systems resources - amps PEs etc. Teradata performance tuning is a technique of improving the process in order for query to perform faster with the minimal use of CPU resources. Performance tuning and optimization of a query involves collecting statistics on join columns, avoiding cross product join, selection of appropriate primary index (to avoid skewness in storage) and using secondary index. Teradata SQL Assistant is an information discovery tool designed for Windows XP and Windows 2000. Teradata SQL Assistant retrieves data from any ODBC-compliant database server. The data can then be manipulated and stored on the desktop PC. 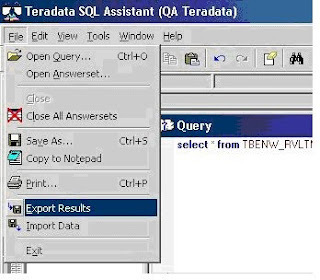 Teradata SQL Assistant for Microsoft Windows, originally called "Queryman" (before V. 6.0)or "QueryMan" (V. 6.0 and up), is also known as "SQLA" among programmers. It supports import / export tasks, but not the serious ones. With its user-friendly GUI, TSA for Windows is generally oriented to business users and casual data consumers. (Refer to BTEQ for comparison.) . * Limit data returned to prevent runaway queries.